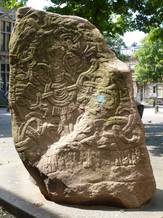 Replica of Harald Bluetooth’s rune stone from Jelling in the Domplein in Utrecht, next to the entrance to the cloister. Photo: Anders Purup. A replica of Harald Bluetooth’s rune stone in Jelling stands in the Domplein of the Dutch city of Utrecht, next to the entrance to the cloister connecting the cathedral to the monastery. 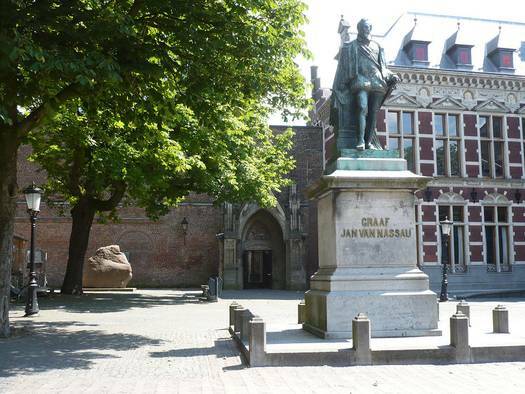 The replica was donated by the Danish Friends of Holland to commemorate the 300-year anniversary of Utrecht University in 1936. The donation was arranged by Gustav Lind, the founder of the Trapholt Art Museum in Kolding. Danes came to Utrecht in the Viking Age, but for quite another purpose. A fleet of Danes ventured to Frisia in 834 and via Utrecht reached the well-known trading site of Dorestadt, now Wijk bij Duurstede. This was plundered and destroyed. Utrecht lies north of the river Lek, one of the outlets of the Rhine into the North Sea. Like many other towns in north-west Europe, Utrecht was attacked several times by Vikings in the ninth century. Willibrordus, the first known missionary among the Danes, died as Bishop of Utrecht in 739. His life is described by his countryman, the English monk Alcuin, who worked as advisor at the court of Charlemagne from 781 until his death in 806. In De vita S. Willibrordi Alcuin recounts how Willibrordus, after a failed attempt in Frisia, journeyed on to the land of the wild Danish people. His meeting with their king Ongendus (? Angantyr) probably took place in the beginning of the eighth century. Ongendus, who according to Alcuin was more cruel than a wild beast and harder than a stone, could not be converted. Willibrordus therefore chose to return to the Frankish Empire, bringing 30 boys back with him. The boys were taught and then baptized. It is not known whether they ever returned home again. Plaque next to the replica of Harald Bluetooth’s rune stone in Utrecht. Photo: Anders Purup. The cloister in Utrecht. Photo: Anders Purup. Replica of Harald Bluetooth’s rune stone at Jelling in the Domplein in Utrecht. Photo: Anders Purup.